January 31, 2008 May 29, 2010 ~ Martha B. While on a recent road trip, I noticed a tepee (also spelled tipi and teepee) in someone’s backyard. It was big enough to be used as a guest house! Since then I’ve seen them popping up in magazines and mail order catalogs. If I had enough space in our yard, I’d love to have one to use for my away room- a place to get away from it all! Here’s some history. Tepees were developed/created by the plains Indians as homes that could be easily dismantled and transported, since these Indians migrated with their food sources. Horses were used to drag the long poles with the covering hides rolled up on top. The parents of these two boys constructed this tepee from long branches and a canvas cover. 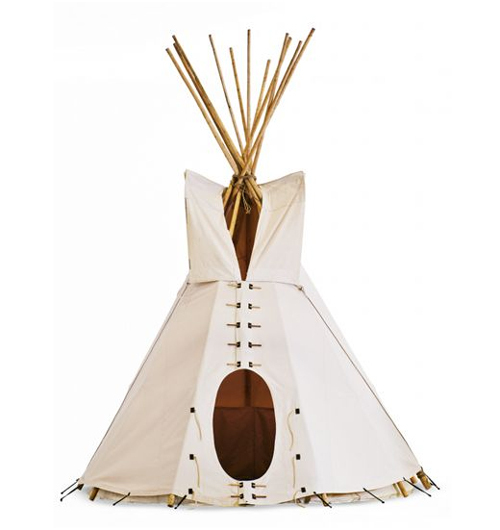 One similar is available at Nomadics Tipis Makers. Model Stella Tennant bought a tepee (look just beyond the garden) and had it set up for her children’s playhouse. Self magazine made this tepee for a photo layout. It was made using birch logs and some great camp blankets. Several companies offer small room-size tepees for children. This one comes from the English Win Green catalog. The addition of a tepee continues the fun mix of furniture and collectibles in this girl’s bedroom. A playroom is another place for a tepee. Available at Land of Nod. This do-it-yourself tepee uses six bamboo poles- each about 6-1/2 ft long. You can get these at garden centers. Assemble the top with rope to form the basic tepee shape. For the cover, measure your poles and use this as the radius for marking the semicircle on the canvas fabric. Don’t forget to include a 1 inch hem. Detailed instructions are in the book, Laura Ashley Decorating Children’s Rooms. Update 5/29/2010- Dave Ellis, creator of canvas tents and tepees, took up the task of designing one for Design Within Reach. And what a tepee! It’s got 16′ Montana pine poles, a tightly woven Army Duck canvas walls and a vinyl mesh floor. What Elle Decor issue was that? I loved this couple’s home, but now I can’t find the issue! Hi Debbie. The issue of Elle Decor you’re looking for is December, 2007. I loved this house too!